My red fleece sweatpants are evil. Wearing them is basically the antidote to any productivity I might muster. As soon as I changed from sweatpants to proper grownup clothing today, I got a ton of stuff done. But listening to Patton Oswalt talking about the miracle of sweatpants made me laugh a lot. Today I am having a day of expat feelings, so I am going to talk about something I love about living in Scotland and something that annoys me. 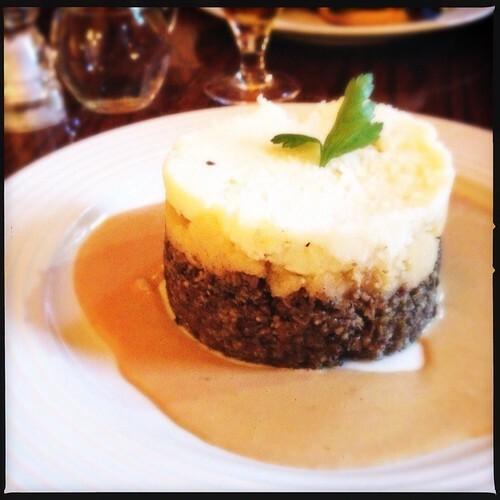 Haggis, neeps, and tatties. Delicious. Writing from: bed, one electric blanket, two kitties. Listening to: Patton Oswalt. What do those words mean? I’ll be numpty until I find out and drouthy when I do. dreich: relating to weather, miserable and overcast and/or rainy (I think rain is usually involved). “Numpty” sounds like a great word FOR delicious. Like, DAMN that haggis lookin numpty as hell! Rain doesn’t have to be involved in dreichness, but it often is. See also ‘it’s gey dreich’ (it’s very dreich) – dreich and gey dreich covering on average 332 days in each year as descriptive terms for the Scottish Lowlands. Okay, I made that up. Cygnoir, you’re a constant source of inspiration. I may stick up on Freesound samples of ‘Will you tell the girls about the murder rate of squirrels in third-world countries?’ just for you. In fact, having got a book on regional British accents for my Xmas, I might try it in some different Scots accents, although my Aberdonian’s a bit rusty. I absolutely cannot wait for these samples, Andrew.